Due to technical difficulties, CKAN installs are not supported. I suggest you use AVC instead. Mini-AVC is already supported. Val drummed her fingers on the Buffalo's dashboard. She loved the view out the front, but there's only so much she could take in before getting bored."Well?" Sitting in the crew cab/lab, Bob checked his laptop's display, puzzling over the results he saw. They didn't make sense. He checked the lab's GPS coordinates. They were in the right spot. "We're in the right place," Bob responded finally, "and I've got the soil composition for this area, so Isaxy will be happy. But these gravity reading are just... strange." 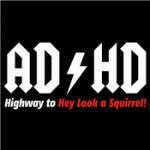 "That's descriptive," Val muttered to herself. "Never mind. What if we set up some negative gravioli detectors up on the ridge and a bit further south? Can we triangulate the anomaly that way? Bob tapped on the laptop for a few seconds. "Yeah, we can do that," he finally answered. Val smiled broadly. She was finally going to fly on Duna! "Dibs on the JetWing then!" The NASA Multimission Modular Space Exploration Vehicle (MMSEV) Is a radical new concept that uses common components for ground rovers and in-space exploration craft. This modularity opens up the possibility of a variety of different configurations. 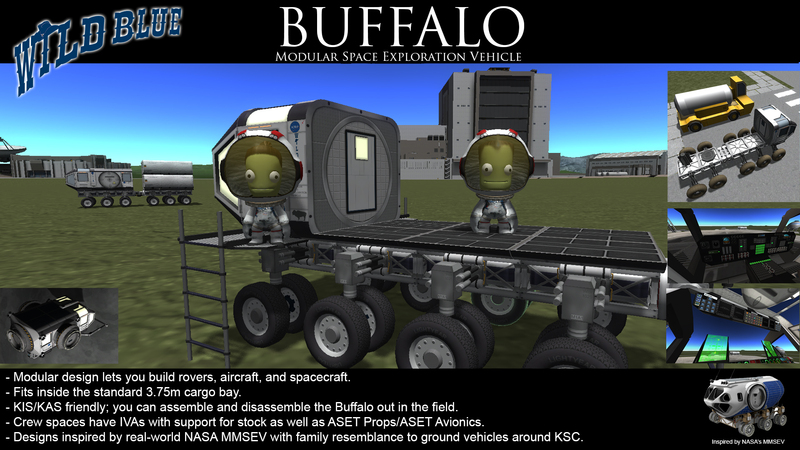 The Buffalo Modular Space Exploration Vehicle (MSEV) is the KSP equivalent from Wild Blue Industries. 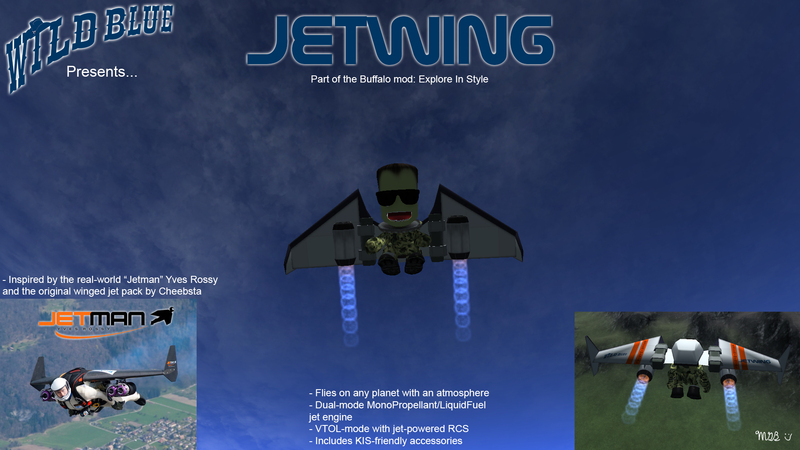 With the Buffalo, you can explore space in style! - Modular design lets you build rovers, aircraft, and spacecraft. - Fits inside the standard 3.75m cargo bay. - KIS/KAS friendly; you can assemble and disassemble the Buffalo out in the field. - Crew spaces have IVAs. Optional Support for ASET. - Designs inspired by real-world NASA MMSEV with family resemblance to ground vehicles around KSC. Eve: Order Zero graphic courtesy of Kuzztler and used with permission. Wild Blue Industries is trademarked by Michael Billard. All Rights Reserved. created for entertainment purposes. It is in no way meant to represent a real entity. Any similarity to a real entity is purely coincidental. 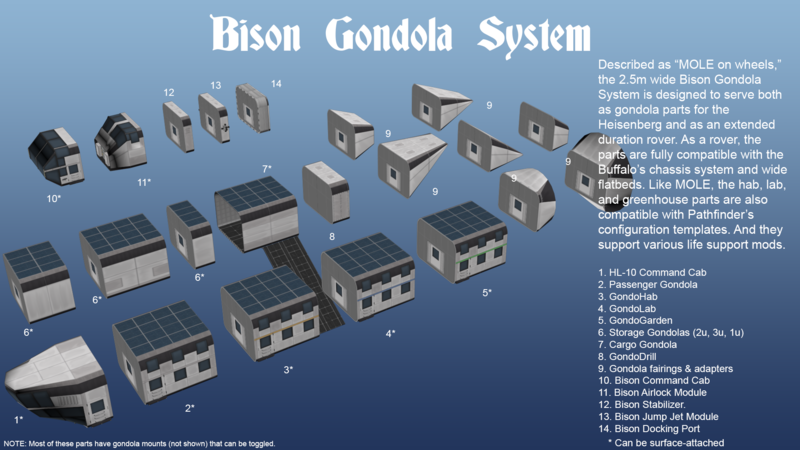 And don't forget about Buffalo's big brother, the Bison, found in the Heisenberg Airship Parts Pack! Wow! This looks really nice! I haven't a chance to try it out, yet, now, but it looks like a great start! And I do love that it looks like the KSP trucks. Are you going to make unique wheels for it, by any chance? Yes absolutely making custom wheels for it. I've never made wheels before so it will take some time. I'm aware of the Buckboard's missing collider and the kerbals going EVA upside down on the crew cabin. I'll have a fix shortly. - Fixed a collider issue with the Buckboard. - Kerbals will now orient properly when going on EVA from the crew cabin. - Made it easier to enter the crew cabin when climbing up the trailer hitch. - The Chassis Decoupler will now show up properly in the parts catalog. - The KAS Pipe ID labels now glow properly. Great questions. There were requests to have the Buffalo separate from Pathfinder, so I gave the MSEV its own mod. I will keep it bundled with Pathfinder for the time being, so you only need to download Pathfinder if you want the Buffalo too. So if you want the MSEV without the base components, then this mod is for you. Yes to the Buffalo probe core, it's on my parts list along with a bunch of other stuff. That reminds me, I have to double-check to see if the Gaslights have RT support. I know they recently got Antenna Range. If they don't, then they will in the next update. For the probe core to have RT support, I'll need a little help since I don't use RT. Do you have any quick examples of the config files? I actually do have a deployable antenna in mind, but I was waiting for KSP 1.1's antenna tech before implementing it..
Oh! This is coming along nicely! I second StahnAileronÃ‚Â´s request for a probe-core. It can be as simple cfg-hacking a probe-core module into 1u-chassi bit. 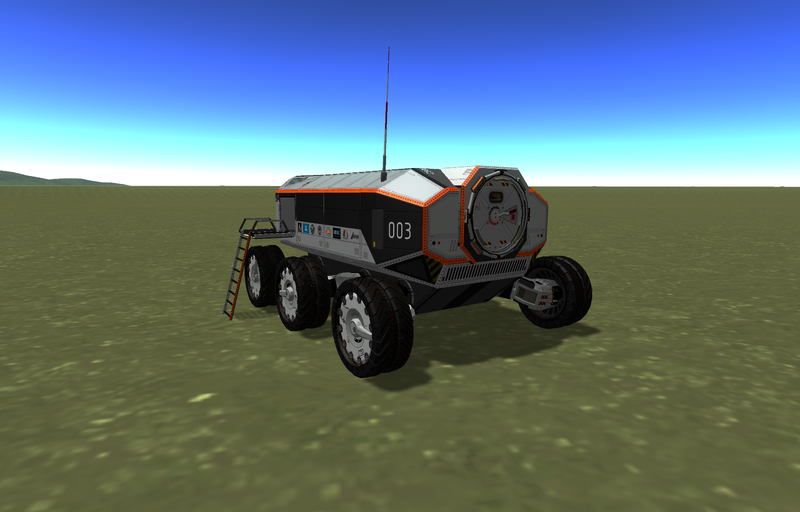 Another thing I kind of miss is a bit to add to the rear end of the vehicle for those time you dont want a cargo-flatbed but a kerbal-transport instead. An nice chamfered adaptor bit (Buffalo-profile => dockingport perhaps). Definitely will have a probe core. I have some ideas based on those automated Google cars that drive around town here in the Silicon Valley. So if I understand, you're looking for something like this? That crew cabin is part of the current release. Only downside is you'll block the crew entryway, and you'll have to exit the vehicle via the command cab. Serious coolness here man. I likes it, I likes it alot! Last I recall, the Gaslight's did not have RT support. I was the one that mentioned RT for the Gaslight's, actually. The problem was if you had a base with RT Antennae, you'd most likely be using the 5,000km Omni model, making the Gaslights kinda redundant as relays UNLESS you don't have a space network up yet AND are using a Local Command Post. But even that's stretching it. Like I said, RT is an awesome mod, but needs a bit more diversity. I already posted some questions in the RT thread to see what I can work with given the current state of that mod. As for RT configs, they're actually one of the more simple and straight forward configs I've seen so far. Just DL the mod (or the github repo I guess) and open one of the RT-specific antenna part configs. Yepp that is basicly what I want to do. DonÃ‚Â´t you think it makes a very sharp edge going from the crew cabin to the docking port? I think a thin adaptor with some chamfer action would smooth up the transition from the square buffalo profile to the more rounded docking port. Hmm... For the future, can we get something like a Utility/Service frame? 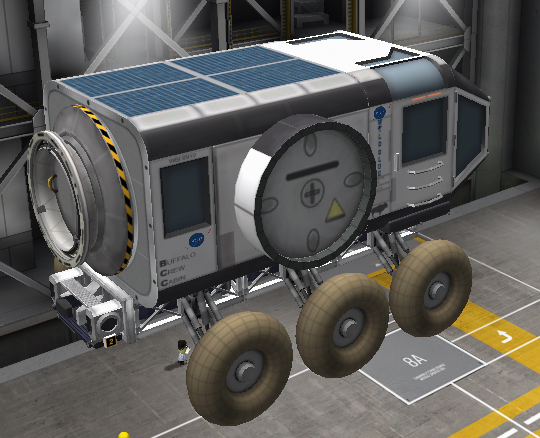 Same length and height as the Wagon (maybe a half-length version too), but a narrow width (still big enough to pass a Kerbal, though) so we can side mount parts, like drills, science, etc. Any thoughts/suggestions on a power set-up for a Buffalo-based mining rig? Oh, is it a better idea to attach the modules together directly (the cockpit, crew, and storage) and then mount the frame/wheels? I'm thinking this is how it should be done to properly allow internal crew movement/transfers. Good question. You'll be ok with fewer wheels on lower gravity worlds. Ah ok, I get it. Basically a Buffalo to 1.25m adapter. I'll have to rethink the crew cab a bit to see if I can add airlocks on the side so the kerbals can get out, but it might work.. The service frame is a great idea, I like it. Maybe something as wide as a chassis? For mods like Connected Living Spaces, attaching the crew modules together and then attaching the chassis works best. For the stock game, it doesn't matter. This is great. There aren't nearly enough lego-style rover parts. ÃƒÅ’ love the design. I can hardly wait for other parts (wagon) for the Buffalo. I love the nose lights, the fluorescent orange lines above the doors and the brightly lit BUFFALO marker at the top of the command module. I absolutely hate the yellow lighting of the windows, it's like looking into a lightbulb. Please make that a little less bright. I noticed that the noselights don't light up the road ahead (that's a pity). I used a 2 square from under the cab and personal module once. After loading the craft on the landingstrip, the cabin and personelmodule sank right through the frame and remained lying on the strip while the frame and tracks took off (but remained controlable nonetheless). Might i request a short endcap which can give the craft a streamlined appearance? I also love the small mission flag above the Wildblue marker! Is the Wagon not in your parts catalog? When I moved things around to make the Buffalo independent of Pathfinder, I might have missed it. I'll take a look at the command cab lights, I'm going for the game's look for lit windows. The command cab does have headlights. Next update I'll widen their beam angle. Thanks for pointing that out. Not sure what you mean that the cab sat on the runway, I haven't seen that issue. And yes I do have plans for a streamlined endcap along with the 1.25m adapter. Thanks for the feedback. Some parts are missing and i think i found the cause. In the wagon2u.cfg. The model is noted as "model = WildBlueIndustriesBuffalo/Assets/Wagon2u". I believe there should be a / between WildBlueIndustries and Buffalo. I havent looked at the other missing parts, but i'm assuming the same could be wrong there. Ik will try if i can recreate the sinking of the cab onto the runway. edit: As suspected, most of the cfg's in the utility directory are missing a / between WildBlueIndustries and Buffalo. Ah, that would do it, I'll fix that in the next update. Sounds like I need another hotfix.. i'll look into a separate animation for the window lights. I've keyed the animations so that the command cab's cabin lights turn on separately from the headlights. Everything is still keyed to the Light action group; I personally like the window lights. But I think I came up with a nice toggleable compromise. Not sure what you mean that the cab sat on the runway, I haven't seen that issue. I've experienced the same issue trying to construct the Buffalo in the SPH on my Career mode save. Apparently, as soon as you put the wheels on a chassis piece, it will detach the chassis unit itself from the rest of the vehicle on loading. Only happens on parts connected indirectly to the command module. So chassis units connected to the command module via other chassis units, will basically detach if you attach a wheel, and act like they have no collider except for the wheels themselves. Although they still remain controllable and no 'part detached' events are logged in the F3 window. Basically, ghost parts. 1. Buffalo wagon unit with crew cab, 2 pieces of chassis, and M1-A1 wheels. 2. Same as 1, but with Rovemax TR-2L wheels. 3. Mk1 command pod with Rovemax TR-2L wheels attached to them. 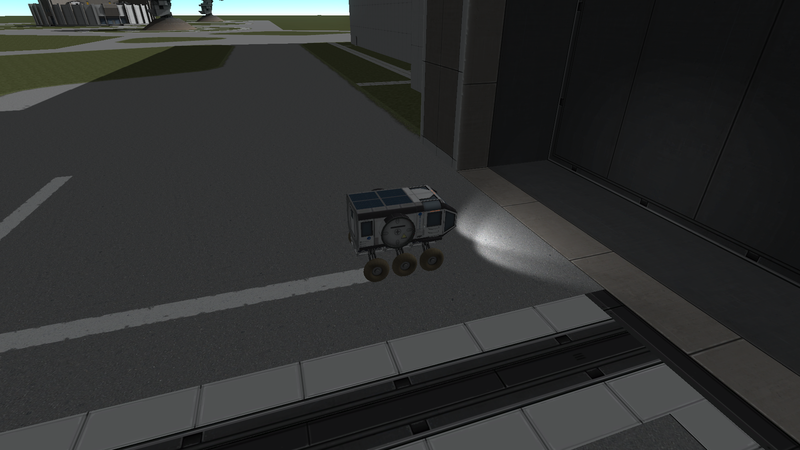 Only rovers 1 and 2, the ones with the chassis pieces, fell off and had the glitch. Rover 3 functioned normally without abnormalities. Hope this helps with bugfixing.